The Philippines where under Spanish control, until the shadowy, masonic sect, Katipunan, began to push for independence. And, in 1897, unveiled a new flag that bears iconography that followed onto the national flag. 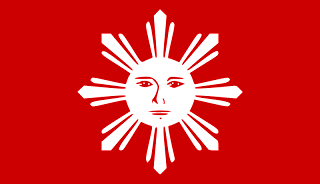 The Katipunan banner was plain red, and in the centre, a smiling face sun logo, with 8 rays. In 1898, The Philippines where in a position to declare independence, and raised the first flag of the First Philippine Republic. A blue and red bicolour flag with a white triangle on the hoist. In the triangle, the sun icon, with 8 rays, and 3 stars in each corner of the triangle. However, in the following year, The Philippines entered into war with the United States. 2 years later, America had won, and placed the Philippines under American colonial rule. With the advent of colonial rule, the flag was initially banned, until 1919, upon the law's repeal. Upon repeal, the only flag related cloth available to make the flag where the colours of the American flag. So, the new Philippine flag was red, and royal blue. A much darker shade than before. In 1935, the Commonwealth of the Philippines was created, granting a great deal of autonomy. However, this government was forced into exile with the invasion of the islands by the Japanese. 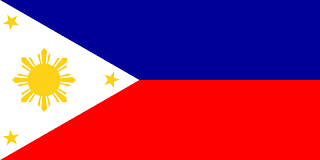 Initially, the Philippine flag was banned. 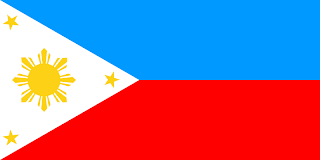 However, in 193, with the creation of the Second Philippine Republic, the "new government" brought back the flag from the first republic, with the lighter blue, and the sun-face. The Royal blue Philippine flag was hoisted once more, when, after kicking the Japanese out, America granted the Philippines independence in 1946. In 1981, the colours of the flag (but not the design) was returned to its original shade of lighter blue. Only for this act to be reversed in 1986! 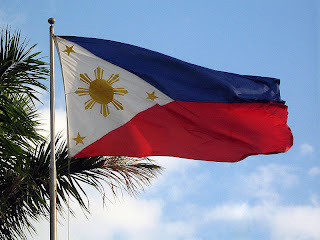 The Flag of the Philippines is unique in the world, as they do not use a war flag, but reverse the state flag. Blue is supposed to be the primary colour, and the colour of peace. However, should a state of war exists, the flag is flipped, with red, the "war" colour, being dominant. The colours in the flag of the Philippines are supposed to represent peace, justice, and truth (blue), and patriotism and valor (red). The sun's eight rays represent the original eight provinces that rose in rebellion against the Spanish, and the 3 stars represent the 3 groups of islands.